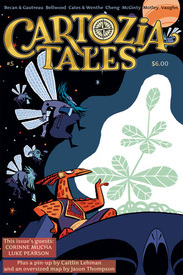 An ambitious, well thought out and nicely produced and printed new (well, kind of) anthology title, Cartozia Talesfeatures an ongoing series of related, sometimes interconnecting tales all set in the same fictional world. It's a bit more complex than this cursory description allows, but readers will quickly discover this on their own. There is a regular ongoing group of artists and writers who return each issue. This group includes series editor, Cates, Shawn Cheng, Sarah Becan, Tom Motley, Jen Vaughn, Lupi McGinty, Lucy Bellwood and Mike Wenthe. This core group is then joined each issue by special guest artists, which so far include Dylan Horrocks, James Kochalka, Corinne Mucha, Luke Pearson, Matt Weigle, Sally Madden, Kevin Cannon and many others. Each 6" x 9" issue runs 40-44 pages and is printed on heavy off white stock with card stock covers. Some issues include added bonuses such as cardboard cut-out "paper dolls" with their own cut-out paper outfits (#2), fold out maps (#5), a board game (#6). 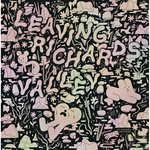 This is a engaging and well done series that shows continued promise; it also stands to fill the vacancy left with the demise of the similarly excellent, but sadly erstwhile comics anthology, Papercutter. Well worth a look!